The first 18 months of caring for my mother, Dotty, were very difficult. I usually use the words burden and heartbreak to describe that period in our lives. I finally concluded that in order to communicate with my mother I had to change. I had to develop a new set of communication skills in order to deal with her new reality. 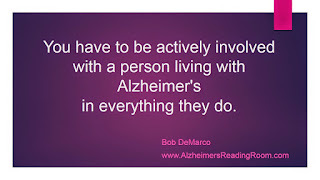 This simple realization lead me to the creation of what I now call Alzheimer's World. Over time, I learned how to step seamlessly into this brand new world. It did take lots of time and effort to get to where I needed to go. But, first I had to understand where I needed to go. During the first 18 months of caring for my mother most of the things I tried backfired on me. Sometimes I would jump in an try and help my mother do something. This often lead to her becoming angry and going into her bedroom and refusing to come out. Why I thought, I am just trying to help her. Sometimes my mom wouild want to do something - like move back home to south Philadelphia. My mother had not lived in south Philadelphia in over 50 years. I would try to explain why she couldn't move back. The more I tried to explain, the more confused she became and then angry. I of course ended up upset and stressed out. Why would she want to leave me? I was taking care of her 24 hours a day, 7 days a week. Didn't she understand this? Obviously, she did not. So I finally made it to Alzheimer's World. Alzheimer's World is a kind and gentle place. A very simple place. A place where we begin to understand what it is like living with dementia. A place where we accept that Alzheimer's changes the brain, and changed the way a person thinks - and feels. What did I do differently? I started to lean up against the wall and watch. Instead of jumping in when my mother rummaged around in the refrigerator, I just watched. I started to understand why she was doing what she was doing. I accepted it. And then, I started to understand the way her brain was working. Why she was doing what she was doing. I started developing tools to deflect her away from her more difficult behaviors. You can learn more by reading this article - How to Use Ice Cream as a Memory Care Tool . I introduced a toy into our lives. A toy who became my mothers best friend; and, a source of respite care for me. Learn about this wonderful toy - Toy Improves Mood and Behavior in Alzheimer's Patient. Then I did something very simple, I reintroduced the word WE back into our lives. I decided we would start living our lives, instead of living in a cave by ourselves like we were doing. I learned that bright light and socialization helped to improve both my mother's mood and her behavior. And then gradually, I started to learn how to communicate effectively with her. Bob DeMarco is the Founder of the Alzheimer's Reading Room (ARR). "Without a doubt, you were the most sensational, inspirational speaker ever! "Caregivers can relate to your message because it truly comes from your heart and your personal experience; and caregivers need to know that others have done it and survived." "You’re a joy to be around, your enthusiasm is infectious. Caregivers continue to this day (2 months since your presentation) to comment on how helpful your presentation was. Many have commented on trying some of your suggestions and being thrilled with the outcomes." "Thank you for highlighting caregiving, giving it the notoriety it deserves." "You have so much more to offer caregivers than I think you realize." "Thank you for sharing. Please keep up the good work, caregivers need to hear your stories, they lend meaning to the intense tasks of constant caring!"